With Sossusvlei, Etosha National Park is one of the most famous parts in Namibia. Located in the North of the country, it is a huge protected area around a salt pan. The park offers great viewing opportunities and is the home of 4 of the Big 5. Here is a guide to help you plan your visit. 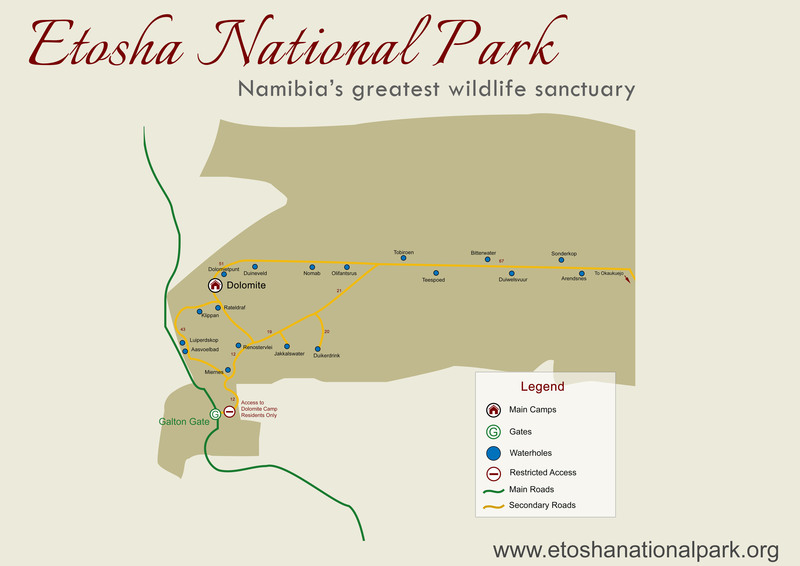 In Etosha National Park you can spot 4 of the Big 5, 114 species of mamals and 340 birds. you can also spot; leopards, giraffes, cheetahsn hyenas, wildebeest, jackals springboks, kudus and more. 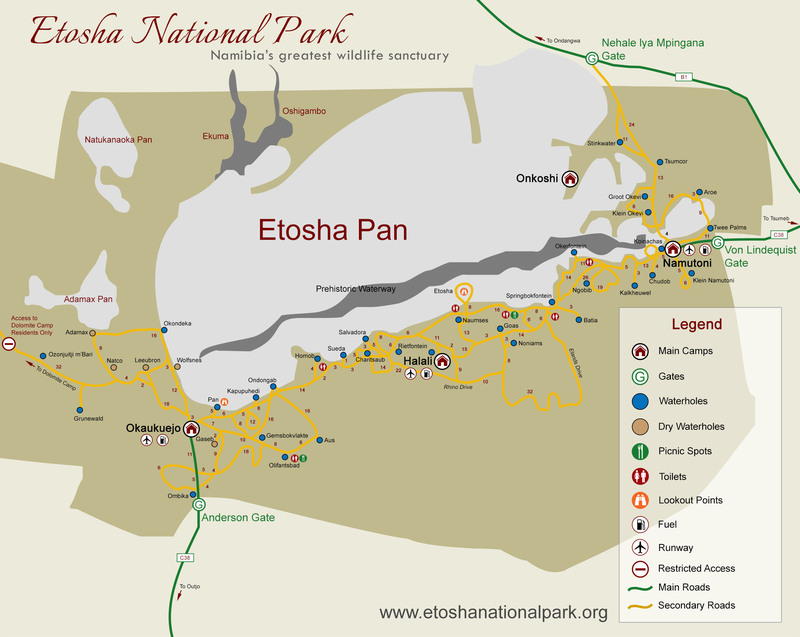 Etosha National Park has 4 access gates. Fees and opening times are avalailable on the park's official website. You should plan to stay at least 2 days in the park, but it deserves its own holiday. Etosha is accessible all year for 2WD. However during the rainy season few tracks can only be accessible to 4WD. Do not get out of your car except in the indicated picnic area and toilets. Remember there are wild animals uot there! Okaukuejo camp: Main camp, adminitrative area of the park. Chalets, rooms and camping available. 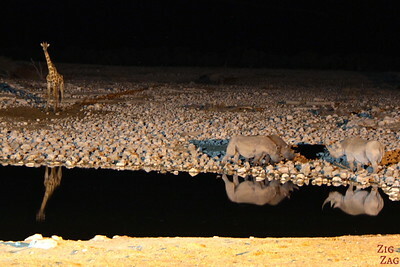 Waterhole lit all night with protected viewing area. Namutoni camp: Built into an old German Fort with a choice of accomodations (chalets, rooms and camping) and facilities. It has elevated view of the King Nehale Waterhole. Good spot for sunset and bird lovers. Dolomite camp: on the west side of the camp. Less touristic, luxurious tents. Elevated views on the plain. Onkoshi camp: chalets on wooden platform near the Etosha pan. Great location for sunrise and sunset. Halali camp: halfway between Namutoni and Okaukuejo, it also has a lit waterhole. Thicker vegetation attracks leopard, Rhinos and elephants. Chalets and rooms availabe. 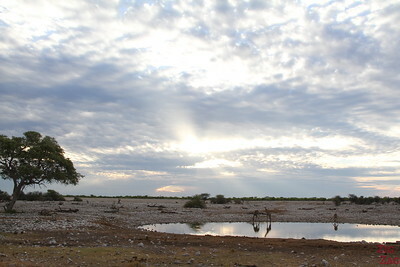 The Okaukuejo is the most famous waterhole in the park. Situated next to the same name rest camp, it is clear of vegetation. A platform with benches has been set up for viewing and it is lit at night. ​Sleep at the camp or in one of the chalets (with view on the waterhole) and spend time on the platform during the night. This is a great experience! What animals do you want to see most? I am hoping to do my first Safari in 2019 in South Africa. I would love to see all the big cats, elephants, zebra, rhinos and much more. I must remember one thing that I can not fuss and stroke any of the big cats which I would love to do. Sue.